Shellac is an excellent finish, not necessarily for table tops (because it's not very protective), but for other projects that won't see too much traffic. 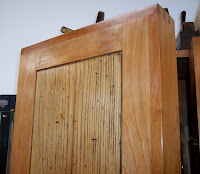 A couple of things that make shellac so great are its ease of application and the speed at which it dries. However, shellac does have a relatively short shelf life. If you mix your own, you have at most 6 months until it goes bad. If you use premixed shellac, like Zinsser, you have about one year to use it once you open the lid. I found out the hard way not to push my luck. I was asked to build some decorative boxes for my church that needed to be ready in time for a very important day. Knowing I was going to use shellac for the finish, I allowed only one day to apply the finish—the day before the important event. After applying 3 coats, I wondered where all the blotchy, shiny spots were coming from. They would rub out momentarily with steel wool, only to reappear a short time later. Ugh. All that careful construction and the finish made the boxes look horrible. I took them to the Woodcr aft Store to consult my buddy, Dan the Finishing Guru, who immediately deduced that I had use d old shellac. Friends, old shellac will never, ever, ever dry. It will always have blotchy, shiny spots and will completely undermine your meticulous craftsmanship. Fortunately, there's another great thing about shellac—it's easy to remove! A little denatured alcohol dissolved all of it. So I mixed a fresh batch, applied several coats, rubbed out the finish the next morning, and had a whole 15 minutes to spare before the big event. Whew! Do you see all of the tell-tale shiny spots at the top of my tool cabinet door? Yeah, I'll fix that someday. *Dan, the finishing guru, says to put a dollup of shellac on a piece of glass, let it sit overnight, and if you can press your fingernail into it the next day, mix up a fresh batch. If you're planning to build a workbench, I highly suggest reading Workbenches: from Design & Theory to Construction & Use, by Christopher Schwarz. The title says it all. Chris includes plans to build both English and French workbenches, but more importantly helps you decide what style, wood, size and vises will work best for your type of woodworking. I can't say enough good things about this book; it's bound to be a classic.